Alton Farnsworth was a reserve center for Syracuse basketball for three seasons. He was a two sport athlete playing basketball and soccer. 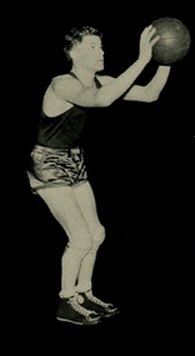 He would letter in soccer in 1934 and basketball in 1935. Farnsworth attended Cazenovia Seminary after going to Newark High School. He would play basketball at Cazenovia and was the captain of the team . He then enrolled at Syracuse University. Farnsworth saw little playing time his sophomore season. He was the reserve center his junior and senior years, backing up star Ed Sonderman. He would graduate from Syracuse in 1935 with a degree in education, and return and get his masters in 1940. After college he would coach high school basketball and teach for Redwood High School, and then at Jordan High School from 1937 to 1941. He was the principal at Canandaigua for several years.